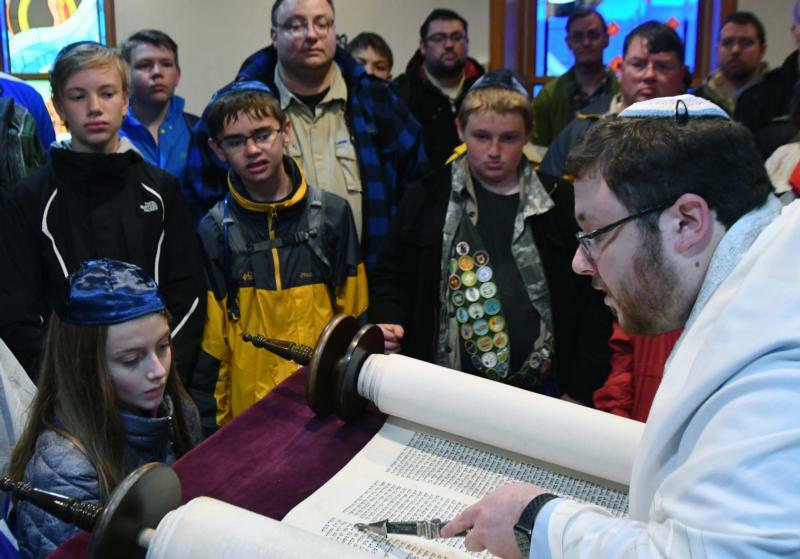 OGDEN, Utah (CNS) — Each year for the past decade, a group of Boy Scouts in Ogden have spent a day walking from house of worship to house of worship, learning how the Ten Commandments are put into practice in different faith traditions. “From the very beginning, the idea was to build an awareness of an ecumenical spirit,” said Deacon Herschel Hester, one of the four original organizers of the Ten Commandments Walk. Because most of the Scouts have never been exposed to a faith outside their own, “the whole idea is for these young men to be introduced to a larger (faith) community than just theirs,” he told the Intermountain Catholic, newspaper of the statewide Diocese of Salt Lake City. “It has nothing to do with a merit badge, but it all has to do with living out the 12th point of the Scout Law: A Scout is reverent,” said Deacon Hester, who is a member of the diocese’s Committee on Scouting and a member of the executive board of the Boy Scouts Trapper Trails Council. Scouts who belong to the council’s member troops take part in the event, which took place this year May 12. The walk also helps emphasize the Scout oath, which promises duty to God, the deacon said. Ninety Scouts participated in the inaugural walk. This year more than 300 boys walked the 6.6-mile route that took them to Ogden’s Second Baptist Church, Emmanuel Church of God in Christ, the Salvation Army, the Episcopal Church of the Good Shepherd, St. Joseph Catholic Church, Elim Lutheran Church, the Church of Jesus Christ of Latter-day Saints’ Fourth Ward, Hope Resurrected Church, First Church of Christ, Scientist, First Presbyterian Church and Congregation Brith Sholem. At the final stop, Rabbi Ben Stern chanted the Ten Commandments in Hebrew from the synagogue’s Torah scroll. “When someone reads Torah, the most important thing is to be accurate on their reading,” he said, and explained that generally on the Jewish Sabbath the person reading or chanting from the Torah uses a book rather than the handwritten scroll because the book is easier to read. Rabbi Stern also answered questions such as why yarmulkes are worn, how long the Jewish worship services are, and the concept of kosher. The night before the hike, the Scouts camped out at Marshall White Center Park. That evening, they heard from Charles W. Dahlquist II, the national commissioner of Boy Scouts of America and past Young Men general president of the Church of Jesus Christ of Latter-day Saints. “Scouting is a world organization of people who care about each other and who care about duty to God and faith in God, and who not only believe what they have learned but they practice what they preach and they practice what they believe,” said Dahlquist. Dahlquist was invited to speak to the gathering by Jacques Behar, a member of the National Jewish Committee on Scouting and president of the Ogden synagogue. “And I always tell them that if you would just concentrate on the 85 percent that we’re all alike, and not so much on the 15 percent that we’re not, the world would be a much better place,” he said.